One of the highlights of travelling in Kerala is the wide range of homestays on offer. Nothing beats the welcoming atmosphere, delicious home-cooked food and chance to meet friendly local people that you get when staying in the home of a Keralan family. 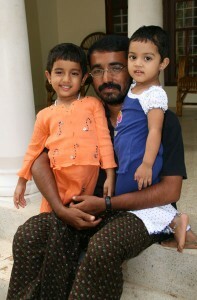 Our best experiences in Kerala (and in India) were had when staying in homestays. Our favourite place of all is Community Greenpalm Homes (aka Thomas’s Homestay), located on a backwater island only 10km from Alleppey, but it feels a world away. I haven’t heard a bad word said by anyone who has stayed here. Everyone comes away enchanted by Thomas and his friendly family, fantastic food, great range of backwater activities, and the unique insight into Keralan culture. Over the next few articles (yes, this will take a while!) I’ll be giving the reasons why I highly recommend a stay at this magical place. 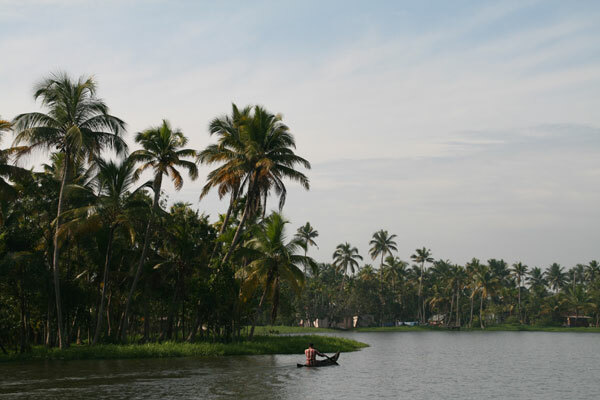 Community Greenpalm Homes is located on Chennamkary, an island in the Keralan backwaters 10km from Alleppey. It’s a gorgeous, lush place of green palms, tropical fruit trees, glistening rice paddy fields, rivers and canals. There are no cars or even roads, and you feel blissfully far from everything. It’s wonderfully peaceful, and very easy to fall into the slow pace of life. This place is the ultimate balm for road (and India) weary travellers. What really makes Greenpalm Homes stand out is the erudite, gentle host Thomas, and his welcoming family. Thomas is an incredibly knowledgeable guy who is the perfect guide to the backwaters. He is very well respected, knows everyone in the village, and knows a lot about the history and culture of the area. As well as meeting Thomas and his family, you’ll have plenty of opportunities to meet the local villagers. Thomas will take you out on leisurely trips around the village, stopping to chat with people along the way or have a cup of chai at the open air tea shop/shacks. People are very friendly, and the further into the backwaters you get, the less they are accustomed to seeing foreigners. You could easily do nothing at the homestay but chill out (see point 4 below), but there are plenty of interesting activities on offer, and I would really recommend you do as many as possible. Thomas will take you out on a variety of trips in the early morning or evening (to avoid the heat), and they are always interesting, and often tailored to your interests. Our favourite activities were a range of walks around the village, the longer bike ride to a neighbouring village, and the sunset canoe ride to the local toddy shop. Motor boat rides are also available to explore further afield, and you can visit one of the many Christian churches on Sundays . Read more about our favourite activities in Part 2. There are lots of activities on offer at the homestay, but during the hot part of the day it is very easy to pass the time just lazing on the verandah or under a palm tree gazing at the river, or chatting to the family or other travellers. This is in fact part of the attraction of the place – it’s the ultimate in relaxation. You definitely need a few days to slow down to the pace of life here, but once you do it is very hard to leave (warning: we extended our stay three times!). We felt completely at peace here. Mmmm! The food is a definite highlight at Greenpalm Homes. Thomas’s mother and wife cook wonderful fresh Keralan food three times a day that is served at a large communal table with other travellers, and sometimes Thomas. The rice is from their own paddy fields, and the vegetables are home-grown. Breakfast is particularly interesting for those of us only used to toast and cereal. Highlights included puttu (steamed rice cakes) with curry, neyyappam (rice pancake filled with coconut and jaggery and cooked in banana leaf), and fried banana. Lunch is the main meal and will involve a huge range of vegetable and curry dishes, rice, chutneys and popadoms. It’s great for vegetarians, although fish and meat is available. The portions are huge and you are always encouraged to keep eating! Dinners are similar but lighter. Meals are long, relaxing and sociable – it’s a great way to meet other travellers. In Part 2 of the Community Greenpalm Homes Review I focus on our favourite activities, while Part 3 looks at the practicalities. In the meantime, if you’d like to book a stay you can email Thomas at community.greenpalms@gmail.com or greenpalmhome@gmail.com or visit their website. This entry was posted on Wednesday, October 21st, 2009 at 10:08 pm	and is filed under Kerala Accommodation, Kerala Backwaters, Kerala India Travel. You can follow any responses to this entry through the RSS 2.0 feed. Both comments and pings are currently closed. After reading the reviews of the Greenpalm homestay, I decided that this is the place for the three of us in our family to stay for four or five days at the end of July this year. I’ve tried to contact and book a few times via the two email addresses listed above for Thomas’s homestay and that was over two months ago. Still would like to stay there as the homestay and the activities sound wonderful….and worthily educational for my nine year old daughter. Any advice? Are the email addresses still operational? Are they still in business? Somewhere else which is similar and not too touristy? Those are the right email addresses and my parents stayed there just a few weeks ago. Thomas can be very slow to respond to email so contacting him by phone may be the best thing to do. I’m sure you’ll love it there. Thank you for the write up. I guess this home stay worth referring to our guests as well. Thanks for the comments comments Phil and Erin it’ll give the reader a heads-up as how Mr.Thomas be contacted. I too have had a challenge getting hold of someone. I did get a response about two weeks after sending an initial email and have emailed back with some questions. I have some concerns because there is little if any personal information on the website – for anyone who might be responsible – presuming a deposit is required. I’m assuming that he acts as a broker to place the people and pays a local family to do the cooking etc. Sounds great however, and I’m hoping it will still work out. I felt the same way about Jojies Homestay in Kochi. This homestay is by far the best thing in Kochi. Not a single guest leaves unhappy. Doyal, a ex-navy man, who runs the homestay with his family could not be kinder. Not only are the rooms exceptionally clean for western standards, but the suggestions and packages they provide are unbeatable. I have traveled to many places around the world and this is a the very top of my list. If you are any where near Kochi, stay at Jojies homestay, like me your plan to stay for one night will turn into two weeks.